I am a Slytherin. I was sorted into Slytherin on Pottermore (as was my brother), and I am a pretty proud Slytherin. I believe in non-evil Slytherins, we just have a bad rep, probably due to our founder being a bit evil. 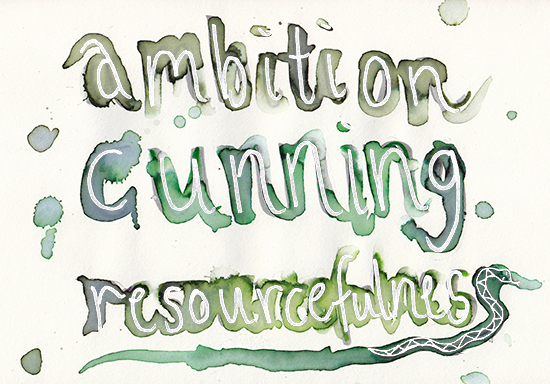 Recently I was reminded of a Slytherins key traits: ambition, cunning, and resourcefulness, and realised I am currently kinda lacking in all these areas. "Slytherins tend to be ambitious, shrewd, cunning, strong leaders, and achievement-oriented. They also have highly developed senses of self-preservation. This means that Slytherins tend to hesitate before acting, so as to weigh all possible outcomes before deciding exactly what should be done. According to Albus Dumbledore, the qualities which Salazar valued in the students he chose included cleverness, resourcefulness, determination, and "a certain disregard for the rules." Dumbledore noted that all of these were qualities possessed by Harry Potter, who was in Gryffindor." "The Slytherin common room is found in the dungeons of Hogwarts Castle, and is located underneath the Black Lake. Because of its location, the light in the common room is green." So I'm presuming you can see out to all the lake creatures swimming around and hear the merpeople's song. And finally, only bloody MERLIN himself was a Slytherin.